So many have claimed that advancements in music technology have allowed for people to create music that wouldn’t have been able to before which has lead to an oversaturated market drowned in unlistenable non-talent. When music critics say this though, they clearly haven’t heard I Am Oak, the brainchild of Thijs Kuijken who creates music gloriously minimalist folk from the comfort of his own bedroom. Latest album, ‘Nowhere Or Tammensaari‘ flirts with the idea of folk from the off with opener ‘Famine‘, with its strummed guitar at the forefront alongside sombre and often haunting vocals. That isn’t to say that I Am Oak are folk per se, after all songs like ‘Drooom‘ have deep thrashings of distortion clanging in the distance that you would perhaps find in a noise band, and ‘Vares Vares‘ vocally flirts with a foreign-slash-English exchange which while indescribable in terms of meaning is interesting to say the least. All of this means that while I Am Oak could just be some regular copycat folk offering, it is in fact experimental and daring in an intelligent subtle way. It’s true, music is over-saturated. I get sent dozens of CDs and review requests and half the time the music isn’t even well rehearsed. Bedroom music can go so very wrong, but every once in a while you find a gem of an album and you realise how important it is that everyone has the ability to create and record music if they want. 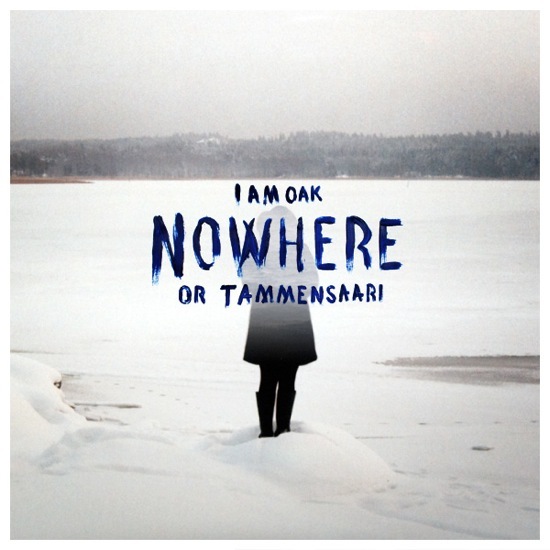 I Am Oak‘s ‘Nowhere Or Tammensaari‘ is this gem of an album and I am so glad I have been able to listen to it. You will be too, so sort it.